From a Dream to a Calling: FAMILYYA at World Youth Day Rio 2013! FAMILYYA Youth Coordinator and Chapel volunteer Jessica Abejar had just recently returned from her pilgrimage to World Youth Day in Rio de Janeiro, Brazil, where she performed during their four-day long Youth Festival. Jessica was recommended as a performer by Chapel moderator Rev. Dr. Joseph Marabe, and her piece "Mother" was selected by the Festival coordinators. Below, Jessica recounts her the details of her performance and the memories made along the path to following her dreams. a famous site in Rio de Janeiro. 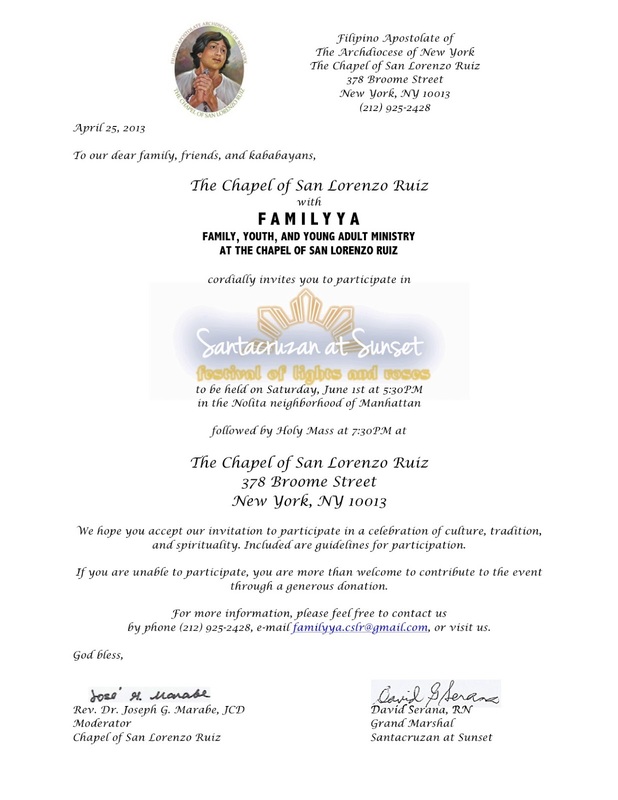 Guidelines for participation can be found on the Chapel of San Lorenzo Ruiz website here. For more info, you may also call Linda at 347-224-2996 or Fr. Marabe at 347-884-0811. FAMILYYA at New York Catholic Youth Day! Members of FAMILYYA attended the first ever New York Catholic Youth Day on Saturday, April 6th! The event was intended to reach out to Catholic youth and young people throughout the archdiocese. Over 1500 high school students, college students, youth ministers, catechists, seminarians, priests, and religious from Staten Island to Orange County and even Queens and North Carolina attended the event at the College of Mount Saint Vincent in the Bronx. His Eminence Timothy Cardinal Dolan even celebrated Mass at the overcrowded Hayes Auditorium. Cardinal Dolan delivered his homily to an enthusiastic crowd, revealing to the many young Catholics in attendance that Jesus was present and that he remains with us as we celebrate the Sacraments and the Mass and when we are good friends to one another and serve the poor. Mass ended with Fr. Joe starting a chant similar to the one said at sports, honoring His Eminence. The Cardinal returned with his own chant, saying "Let's go eat!" From contemporary music to rapping priests to a video clip of Zombies vs. Jesus Christ, the event left many Catholics young and old feeling uplifted and renewed in their faith. It was overall success and looks to be a yearly mainstay for the newly formed Office of Youth Ministry at the Archdiocese of New York. 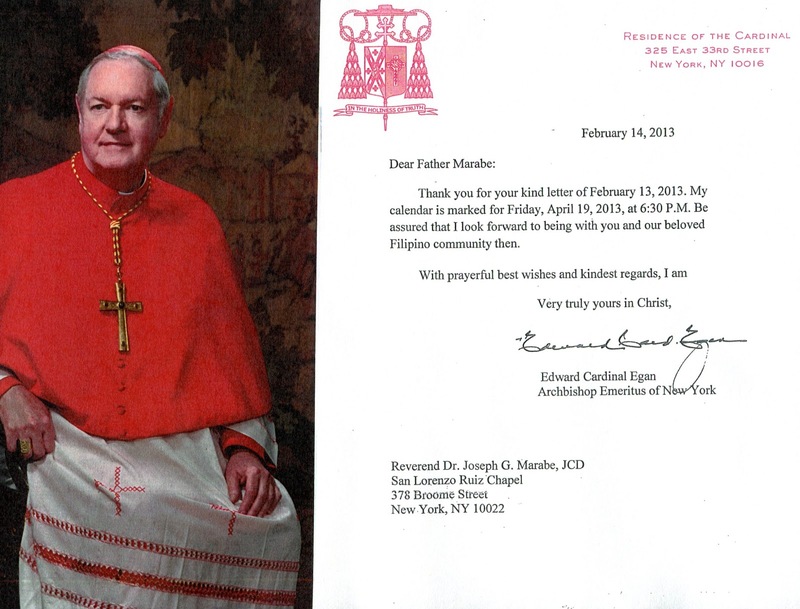 The event was sponsored by the Archdiocese of New York's Office of Youth Ministry, headed by Fr. Joseph Espaillat and Cynthia Martinez and was hosted by MCs Michelle Gonzalez, Robert Gadomski, and Sr. Faustina Maria Pia, S.V. Keynote speakers were Fr. 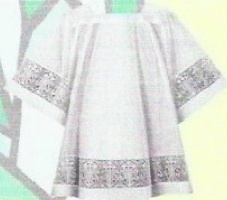 Stan Fortuna, CFR and Fr. Daniel O' Reilly with workshops led by Fr. Agustino Torres, CFR, Tim Hanley, Fr. Stephen Norton, and Richard Espinal. Entertainment included performances from the Fuego Ardiente Danza Ministry, Joan Sanchez & RP Band, and Rio Squad as well as Full Armor Band, who provided music during the Mass and Adoration. Click the link for more photos from the event. Today, April 2nd is the Feast Day of San Pedro Calungsod! The 17-year-old martyr was recently canonized by Pope Emeritus Benedict XVI last October with several other new saints. San Pedro Calungsod is the second Filipino saint and the first to hail from the Visayas! 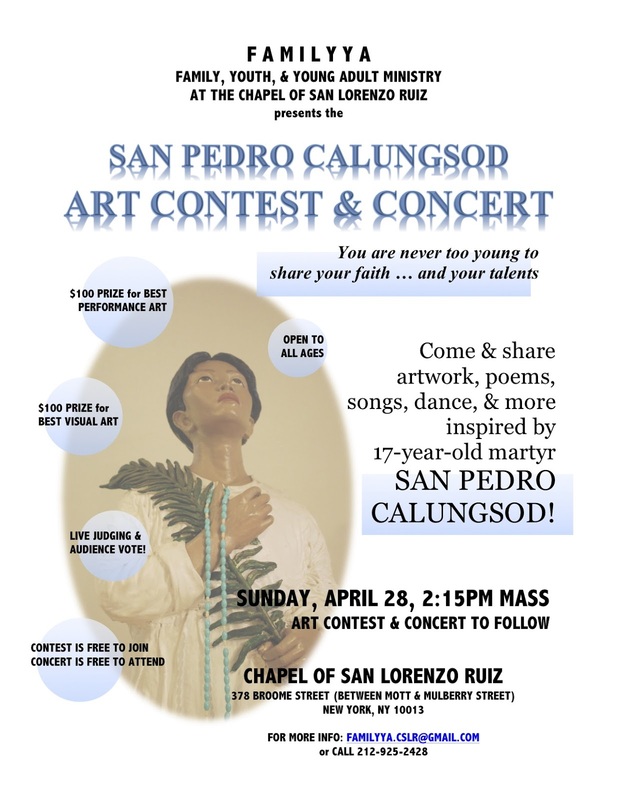 The Chapel of San Lorenzo Ruiz will be celebrating Mass in his honor followed by an Art Contest & Concert hosted by FAMILYYA on Sunday, April 28 @ 2:15PM! Click the link to find out more details about the contest! 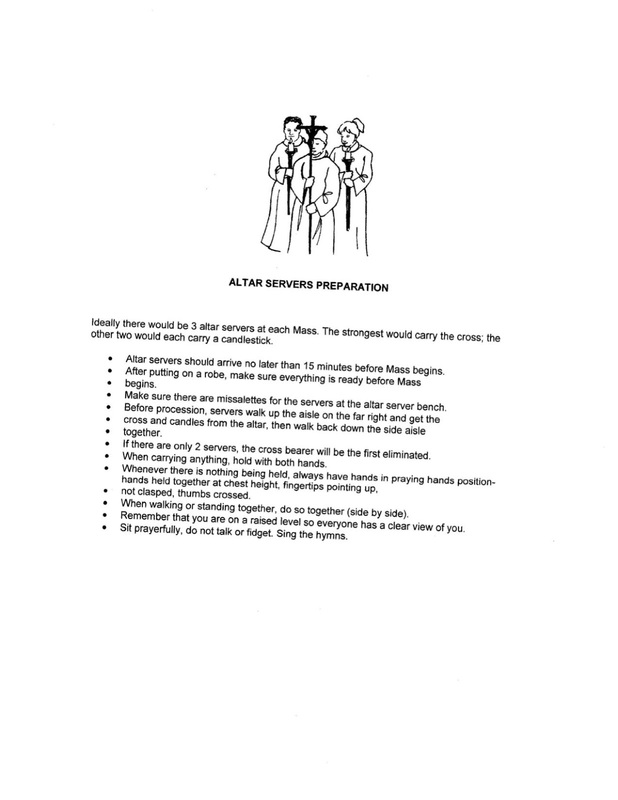 Kissy created the Way of the Cross beads as an aid in reciting the Stations. Kissy is an active volunteer of the Chapel of San Lorenzo Ruiz, accompanying the choir on keyboard at Mass. FAMILYYA congratulates Kissy on her win! 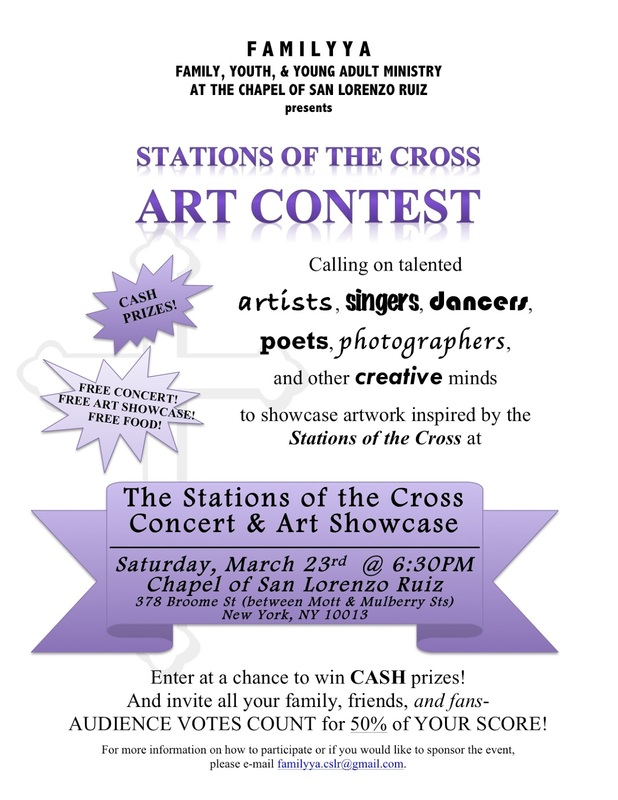 It's not too late to join the Stations of the Cross Art Contest and Concert! The contest is FREE to enter and is open to people of all ages and talents. Two prizes of $100 each will be awarded to the best visual art and the best performance art. Not quite the artist? The concert and showcase is FREE to attend with snacks and refreshments to be served. Artists who wish to enter can sign-up upon arrival. 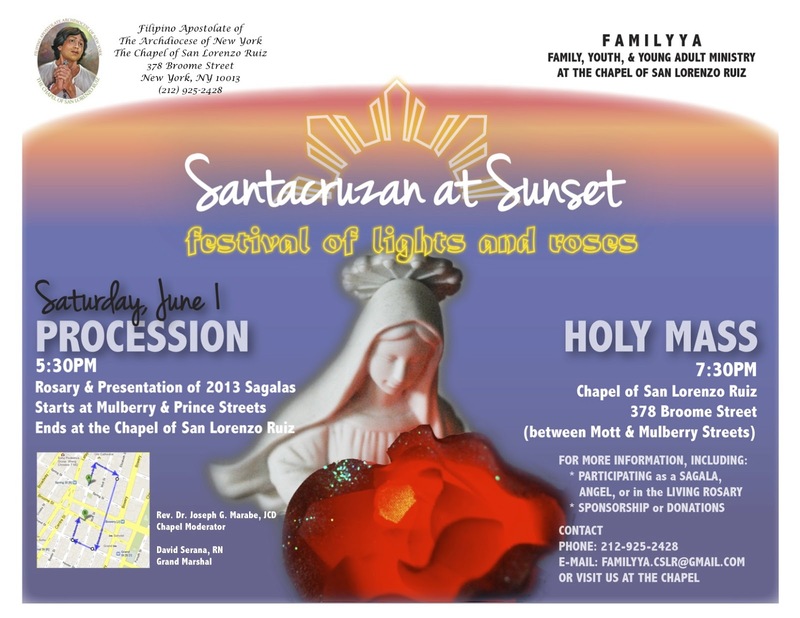 Theme is the Stations of the Cross and is free to interpretation. All participants will receive a prize for entering. Also, audience vote counts for 50% of each artist's score, so bring as many family and friends along! The Chapel of San Lorenzo Ruiz is located on 378 Broome Street (between Mott and Mulberry Streets) and is accessible by car or public transportation. For more information, please e-mail familyya.cslr@gmail.com. The Tree of Miracles Makes Its Debut! On Sunday, March 10th, the Tree of Miracles made its debut at the Chapel of San Lorenzo Ruiz. The Tree of Miracles is a fundraiser that helps support FAMILYYA, the Family, Youth, and Young Adult Ministry, at the Chapel of San Lorenzo Ruiz. 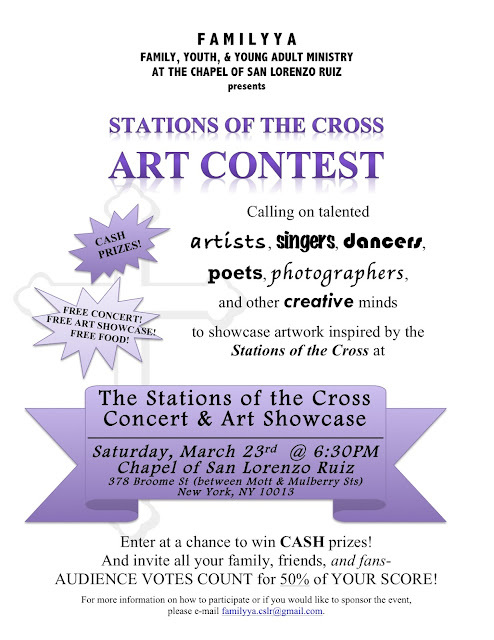 the Stations of the Cross Art Contest & Concert. How does the Tree of Miracles work? Take a red envelope. Write your petition. Place your donation in the red envelope and write the donation amount on the flap. Then, a member of FAMILYYA will be there to assist you in hanging up your red envelope on the Tree of Miracles. Then watch your miracle grow! *Money will be collected and recorded at the end of the day while the red envelopes remain on the Tree of Miracles until the end of the month. Check out the Tree of Miracles at the Chapel of San Lorenzo Ruiz at 378 Broome Street (between Mott and Mulberry Streets), New York, NY 10013. Accessible by car and public transportation. 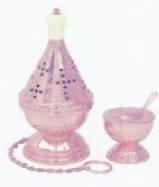 FAMILYYA Lessons: Can you name these objects in the Mass? Think you know all the names of these objects found in the Mass? Learn more about these and other objects found in the Mass! Called to serve but just don't know how? 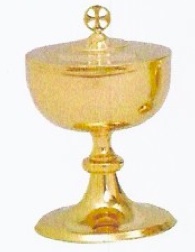 Learn the rubrics of altar serving with this training guide!